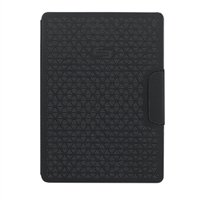 Solo Vector iPad Air Slim Case. Protective tray securely holds iPad air. Magnetic cover sleeps and wakes your iPad Air. Adjust to multiple viewing angles. Rear opening for camera allows you to shoot photos while keeping your iPad Air in the Case.